Happy Tuesday and last day of February!! Spring can't be too far behind now that we are heading into March right? RIGHT??? I don't know about you, but I am ready for some sunshine and warm weather!! 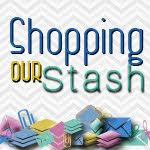 To inspire your thoughts of spring, this week the SHOPPING OUR STASH crew is bringing you a colour challenge. 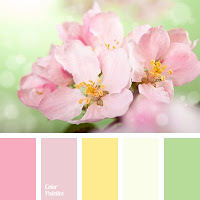 We would like you to incorporate the colours in the spring colour palette below into your project. I made an ATC for the challenge. 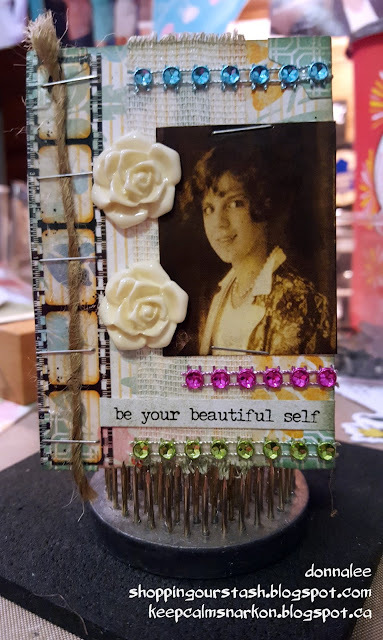 I really like making ATCs and I don't make them nearly enough. When I do make one I think, wow, that was a lot of work for such a little project! I do however like seeing how much stuff from my stash I can squeeze into a small 2 1/2" x 3 1/2" space...as you can see below...quite a bit! I may have taken some creative license with the colour palette, but if you look hard enough, all the colours are there! For reals! While you are there, please share some crafty lovin' with the rest of the crew and our guest designer! As you know I love ATCs too. this one is fabulous nice job on the challenge and fitting so much "stuff" on one little card. Amazing just how much (shite) you can put on an ATC. This is a super gorgeous fabulous layout and so so colourful Donna. I agree with everybody Donna, it's simply amazing how beautifully every single element on your card fits perfectly in such a small space without looking cluttered, it looks just fabulous. Love that picture and yes!! all the colors of the challenge are there. There is sooooooo much goodness piled onto this little ATC! Love it all!